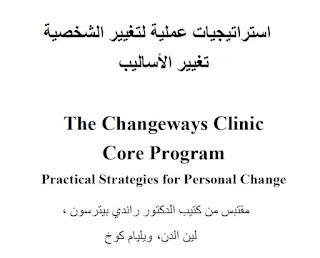 A few weeks ago I posted the announcement that the Changeways Core Program was available in Farsi. Today I'm happy to add that we are also making it available in Arabic. Like the Farsi edition, this one is being made available free of charge to appropriate healthcare professionals. Changeways Clinic began its life at UBC Hospital in Vancouver as a post-hospitalization group therapy program for clients suffering from major depression. We developed The Core Program, a cognitive behavioural therapy protocol for running these groups. This includes a manual for clients and another for therapists running the program. This program was remarkably successful, and we have updated the program repeatedly to incorporate client and clinician feedback and new research. (We call the current version the "3rd Edition" but the first few versions weren't numbered - it's probably actually the 6th Edition.) The program is in use across Canada, and has been implemented in the USA, the United Kingdom, Hong Kong, and Australia as well. The problem, of course, is that not everyone is able to read the English language manual. Canada is a land of newcomers, and some would benefit more from having the materials in their own language. But translations are notoriously expensive, and so we have been restricted in our ability to provide multilingual editions. Sharareh Haji Ghorbankhani and Hevin Kurdi worked together to create the translation. Sharareh has offered the program in the Greater Vancouver area in English and has also worked with the Arabic speaking population. The translation is an immense project, running to 74 pages. The manual is not simply a word for word translation, but also a cultural translation, expressing the concepts in a way that is designed to be most accessible to Arabic-speaking populations. The original intent was to create an edition to accompany groups based on the program that were being offered for the Arabic-speaking community in Vancouver. Like Goli Shifteh, who worked on the Farsi manual, Sharareh soon saw that the resource could be used for Arabic-speaking populations anywhere in the world. Consequently, it would be nice to make it more widely available. The question is how. The decision we arrived at is to make the Arabic Participant Manual available free of charge to universities, physicians, and mental health professionals in a pdf format. This is also what we decided for the Farsi edition. 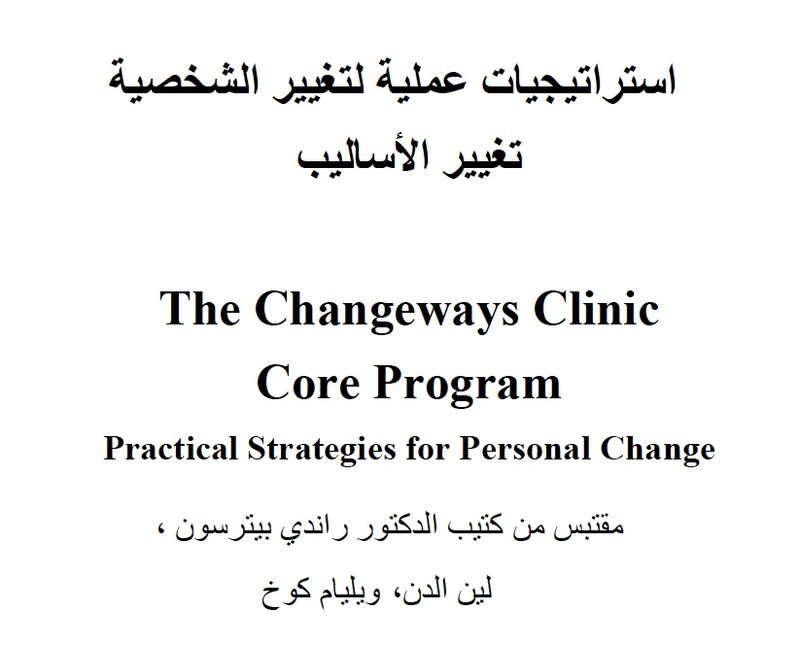 One option was to simply post the pdf on the Changeways Clinic website, but we wanted to try to get the manual into the hands of responsible trained professionals. Consequently, we've decided to offer the manual upon email request. Simply email us at products (at) changeways.com. State your profession, country, and a brief reason for wishing a copy of the program, and we will reply with pdf versions of the client manual and related forms for your use and for reproduction for your own clients. Once you have the manual, you may make as many copies for as many of your own clients as you wish. We do not require that your service be free of charge or covered by a government-funded health program. Many users of the Core Program are in private practice. For more information on the translations, visit www.changeways.com - specifically the translation page here. What if I don't speak (or read) Arabic? The translation includes many of the graphics from the English-language version, and a few bilingual bits. If you have an English-language copy of the manual, you should be able to tell what you are handing to the client. We imagine that many users of the translation will be English-speaking clinicians already familiar with the Core Program, who wish to provide a translated version for their Arabic-speaking clients. The Clinician Guide for the program has not been translated, because it is considerably longer than the Participant Manual and translating it would have been an enormous job. This English-language guide is available from our offices as well, but regrettably we do have to charge for it. We have created an electronic pdf version available upon request. This allows us to supply it at lower cost than the hard-copy version. If you don't have a copy, simply inquire about this when you write us. The pdf translation (and any documents purchased or received from Changeways Clinic) is provided specifically to the professional requesting it. It may not be forwarded on to others without the written permission of Changeways Clinic, nor posted in any way on the internet. Many thanks to the team of Sharareh Haji Ghorbankhani and Hevin Kurdi for the many hours of work they spent on this project. It is their wish that the program be made available as widely as possible for the benefit of the greatest number of people.